I've been wanting to see this one for a while. A big reason is because of Johnny Depp, but I also thought the trailers looked interesting. I went to see the movie on Wednesday and I really enjoyed it. I'd go see it again and I'll add it to my movie collection once it is available. The movie is a little different from what I expected, but I really liked it. 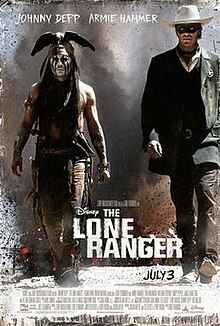 The movie shows how John becomes the Lone Ranger and how he first meets Tonto, who is really behind him becoming the Lone Ranger. Tonto isn't just a sidekick following along. He is more of an equal and some of what happens is directly tied to him and his decisions. He also has a dead bird on his head, which is kind of odd at first, but there is an explanation eventually that I think makes sense. There is a method to his madness that I think works. The story is interesting and entertaining. It is a fun adventure movie that is worth checking out. There is a decent amount of action that involves chases, trains, and explosions. Real trains were used and stunt men were used..stuff wasn't done strictly with CGI. The action scenes work well. There is also a good amount of humor, something that some people may not expect. I think it works for the movie. The characters are interesting. Cavendish, the villain, is evil in a way I didn't expect and he makes a good villain. Armie Hammer and Johnny Depp work together well and I liked both of them in their parts. The Lone Ranger is a fun adventure movie that is entertaining and deserves to be seen. I would have rated it 4.5 stars at Epinions. Since I can't do that there, I rounded it up to 5. Weird how all the reviews are poor, it's heading for a flop, yet it was actually bloody good! Could one reason be that they seemed to have made the Lone Ranger to be Tonto's sidekick, rather than the other way around? I haven't seen it, but that's the impression I get. Going too far from the original concept will often turn a lot of people against a film (think "Howard the Duck", for example). There's some truth in that, and Tonto is a narratively in a similar position to Jack Sparrow in the Pirates films. It doesn't help that Depp is a bigger star than the lead, but Armie Hammer is a strong lead nonetheless and the script serves him better than Orlando Bloom was. is still the main poster boy with his name over the title! The other reason for it's failure though is probably that the western isn't the draw it once was, which is sad. Blockbuster crowds just don't want it and the best thing about Lone Ranger is that Verbinski has made a genuine romantic western, at least half a one anyway! Maybe the film's length is a problem as well? Maybe. It is longer than it needs to be, but people wouldn't be out of by that necessarily. I mean, everyone went to see Titanic! For whatever reason..that I have yet to figure out, a lot of people and critics were already running the movie down before it was out and before they saw it. It is almost like there was some sort of super secret meeting and everyone agreed to trash the movie. The marketing wasn't right...and the release date, at least over here was bad. It was a very, very, very bad idea to have it open the same day as Despicable Me 2. Bad, bad, bad idea. Bad.